Generous donations to a non-profit can often become more of a burden than a blessing which is why it is important to have a good donation policy and properly evaluate the impact of the donation upon the organization. According to a story in Non Profit Quarterly, this is exactly the challenge being faced by the Great American Songbook Foundation in Carmel, IN. The organization with a budget of less than $1 million was approached with a non-strings attached donation of an estate valued at $30 million. ….includes a couple of golf courses, a pool, a fully furnished 50,000-square-foot main house, and a clubhouse—all set on 107 acres. There are no conditions on the contribution. The upkeep alone could easily eat up the entire current budget of the organization, what with the nine staff required to maintain the property, and it should be pretty darn clear to any manager or board who have taken a trip or two around the block that such a gift could potentially ruin the organization. This isn’t the first time the Simons have tried to move the property, which has covenants that disallow certain kinds of development. In fact, the property has been on the market since 2014 at $25 million with no takers. Additionally, a previous attempt to contribute the property to the Indiana University Foundation in 2008 fell through. The Songbook Foundation Board is going to take three years to study the use of the estate which is probably a wise course of action. The NPQ article notes that since they accepted the donation of the estate, they will bear the costs associated with maintaining the estate during that time. There are a number of options available to the Songbook Foundation according to another article. The foundation could decide to use the main house as a museum and center of operations, subject to a rezone. The golf course land could be sold in a plan similar to Estridge’s but with lot sizes that meet the covenants. That money could be used to support operation of the museum. The entire property, including the main house, could be sold to a developer. That money could be used to support the foundation or build the Great American Songbook Museum closer to The Palladium, possibly next to the soon-to-be-built luxury hotel, The Carmichael. …He [McDermott] said charity events could be held on the golf course and added that a donation this size is a signal to other potential donors who were thinking of writing a check. If they decide to keep the properties, they will almost definitely need to set up a separate administrative body to keep themselves from getting bogged down in the business of overseeing the estates. Not to mention there might be issues that conflict with their non-profit status. The unrelated business incomes from the estates could potentially be 25+ times greater than that of the non-profit. It will be really interesting to see what they decide to do. I made a post on the ArtsHacker site about two years ago that included lists and links to various resources one can use to create a gift acceptance policy and to evaluate the suitability of accepting gifts when donors approach the organization. Gotta give a shout out to Non-Profit Quarterly for putting up two theatre related articles yesterday. I wanted to call attention to it to show appreciation for to them for covering arts concerns. The first piece by Ross Jackson on Blackness in Nonprofit Theater reinforces a lot of the conversations that have been occurring lately about the recognition and opportunities afforded people of color. It’s publication is timely just as we move into February when many arts organizations offer their Black History Month programming. Jackson rightly criticizes this approach, (or having any sort of “ethnic slot”), as tokenism. 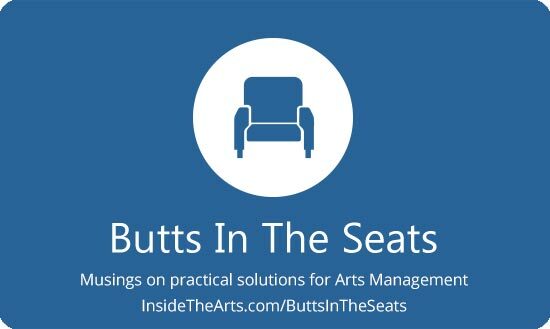 I think many more arts organizations recognize this than had 10-15 years ago and have taken steps to remedy this. Jackson goes on to point out some less obvious, but equally problematic choices that are made in casting and programming decisions. More troubling is that the lone black cast member is usually male. Black women are often cast only when the script calls for them or to fill promiscuous and degenerate roles…for example, auditioning a black actor who has the talent to play Rosalind, the witty, courageous leading lady of the court from Shakespeare’s As You Like It, whom the audience is made to feel deserves love, and casting her instead as Phebe, the entitled, arrogant, shepherdess who is criticized for having too many lovers. Rosalind stays white. Furthermore, when casting black actors in nonspecific roles, it is not at all necessary to reimagine or reconceptualize the production by placing it in the inner city or adding what a middle-aged white male thinks of as a “Hip-Hop influence,” in order to “excuse” the decision to have black bodies present onstage. We don’t all walk around with a bassline underscoring our every action; there is no reality to that, so do not try to insert it for us. He goes to provide other examples which place black actors in the status of otherness. He proposes ways in which organizations can examine their choices and processes. The other mention of theater on Non-Profit Quarterly was about how theaters are becoming more effective at cultivating individual donors to support their work as corporate support wanes. The piece draws from an article in American Theater. The American Theater article is worth reading because it goes into greater detail than the NPQ piece. However, Eileen Cunniffe does a good job summarizing on NPQ. The reason why many theaters have become more effective is because they are using predictive analytic tools and engaging in one-on-one relationship building to a much greater degree than in the past. That isn’t necessarily good news for every theater company who lack the resources to keep up. …the newer approaches to donor cultivation that have been successful for nonprofit theater companies are also more labor-intensive—sometimes requiring additional development staff, other times requiring more flexibility from development staffers in terms of when they work, adding more evening and weekend hours to woo donors—again, including board members—before and during theater performances. He also notes that fundraisers must pay more attention than ever to generational differences among individual donors. Finally, these approaches are likely to bear more fruit for larger theater companies that can afford to invest more in fundraising; they may be unnecessary for the smaller companies, which already know most of their individual donors quite well; and the better they work for the larger companies, the more they may disadvantage midsized companies, which may not be able to invest in additional staff or bells and whistles like predictive modeling. I recently published a short piece on ArtsHacker about how important the leadership of non-profit board chairs was to the success of the organization. Much of the information was draw from a webinar Non-Profit Quarterly hosted about Board Source’s most recent Leading With Intent report. I just got around to reading the report in the last week. Since the finds are summarized pretty prominently on the Leading With Intent home page, I will leave readers take a look themselves and hopefully choose to focus in on areas of interest, if not read the whole thing. Of course, general observations don’t give you the full story. While I wasn’t surprised to read that board membership isn’t becoming more diverse and their current composition is inhibiting efforts at diversity, I was interested to read that executive directors felt much more strongly than board chairs that the lack of diversity was a problem. Sixty-five percent of executive directors versus 41% of board chairs were somewhat or extremely dissatisfied with the level racial and ethnic diversity. It is possible chief executives express higher levels of dissatisfaction with the board’s racial and ethnic diversity because they are more exposed to the way it is affecting their organization. Seventy-nine (79) percent of chief executives say that expanding racial and ethnic diversity is important, or greatly important, to increasing their organization’s ability to advance its mission. If an organization is facing issues and challenges due to a lack of board diversity, chief executives are wise to help the board understand these issues rather than continuing to make the case for diversity without the board fully understanding what is at stake. My guess is that pretty much everyone in the arts and culture sector understands that the recent push for greater diversity in commercial entertainment and associated award shows isn’t just applicable to commercial or entertainment enterprises. If you are under the impression that this is all just a fad and will stop at the edge of the televised red carpet, ooooh boy, you better pay closer attention. It wouldn’t be at all surprising if inclusion displaced overhead ratio as a primary measure of effectiveness and worthiness among funders, patrons and donors. While lack of diversity in terms of race/ethnicity was the biggest source of dissatisfaction, lack of diversity in terms of socioeconomic status, age, gender, sexual orientation and persons with disabilities was roughly equal for executive officers (~30%) and presumably growing. The general aim of both pieces was to emphasize the need to distinguish the context in which advice and comments are being made. When the lawyer board member makes a comment, is it a legal opinion or personal opinion? Are people according the member’s personal opinion more deference due to their profession? When they provide their professional opinion, could it be clouded by the fact they earlier advocated or voted for a related course of action? Is a conversation covered by attorney-client privilege? Loss of Attorney-Client Privilege. Are you communications with the rest of the board protected by the attorney-client privilege? If it’s clear that the communications are to be attorney-client communications, they should be protected by the privilege. However, such protection may be lost if it’s not clear that you are communicating only as a lawyer or if the communication is recorded in minutes to which other persons have access. If a lawyer represents a statement as professional advice, do they actually have the specialized knowledge and experience to offer that advice? Actually, as I notice the strong similarities between my ArtsHacker post and the recent Non-Profit Business Advisor article, I realize that both were drawn from lawyers at the same law firm so either of the links here represent a good resource for exploring the nuances of this topic more carefully.